This book discusses new strategies to prolong food shelf life. It reviews the development of active packaging and analyzes the mass transport properties of food packaging. Packaging and Food Preservation addresses three main topics: mass transport properties of packaging for food applications, development of active packaging, and new strategies to prolong food shelf life. 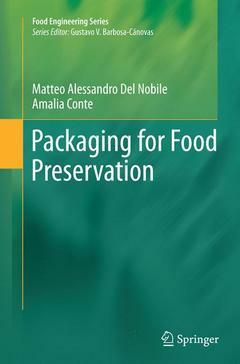 More specifically, the book discusses several mathematical models, relevant research on active packaging, and case studies that highlight the best combination of technologies to prolong the shelf-life of principal food commodities. Section I. Shelf life modeling of packaged food.- Direct Models for Shelf Life Prediction.- Influence of mass transport properties of films on the shelf life of packaged food.- Mechanistic models for shelf life prediction.- Section II. Low Environmental Impact Active Packaging.- Different approaches to manufacture active films.- Bio-based packaging materials for controlled release of active compounds.- Section III. New Strategies to Prolong Food Shelf Life.- Packaging Protection for Liquid Foods.- Minimally processed food: packaging for quality preservation.- Innovations in Fresh Dairy Products Packaging.- Packaging for Preservation of Meat- and Fish-Based Products. Matteo Alessandro Del Nobile is Full Professor at the Department of Agricultural Sciences, Food, and Environment, University of Foggia, Italy. His main areas of interest include mass diffusion through polymeric materials, packaging structure design, and functional foods. These topics have been approached from both a theoretical and an experimental point of view. He has published over 150 papers on topics related to polymer and food science. Amalia Conte is a Researcher at the Department of Agricultural Sciences, Food, and Environment, University of Foggia, Italy. Her main interests lie in the development and validation of food with functional properties, and the studying of preservation systems for fresh food. Conte is co-author of more than 80 scientific publications in international journals, and has presented numerous works at international conferences on food technology.